If there was an award or an honorable mention for most Android devices displayed at CES 2013, that would have gone to Alcatel. Despite being among the lesser known players on the Android device market, the company brought no less than 10 different smartphones and tablets to the show, ranging from entry-level handsets to respectable upper mid-range phones. Yet don't expect these upcoming devices to hit the shelves all at the same time. The Alcatel One Touch Scribe HD, for example, should launch in Europe no sooner than March while the Alcatel One Touch M'Pop is expected to make a splash in April, as a company spokesperson confirmed earlier today. The Alcatel One Touch Evo 7 HD tablet will be released on the European market around early June. We must also note that Alcatel has different plans for each market throughout Europe. In other words, we are expecting each country to get only those One Touch devices that Alcatel chooses to release there. 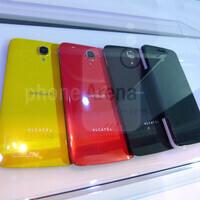 Several of these Alcatel smartphones and tablets will be released in the U.S. as well, albeit at a later time. The One Touch Scribe lineup is planned to make its Stateside debut in Q3 of this year. The entry-level Alcatel One Touch M'Pop is also headed to the States, but whether any carrier would be interested in it isn't yet known.